Developers AMCAL Equities announced on August 31, 2017 that construction has begun on The Clarendon, a new apartment complex in Woodland Hills, just a block northeast of Topanga and Laurel Canyon boulevards, and right in the crook of the 101 freeway. The five-story building will hold 335 apartments, running from studios up to three-bedrooms; 26 of the units will be rented to tenants using Section 8 vouchers. 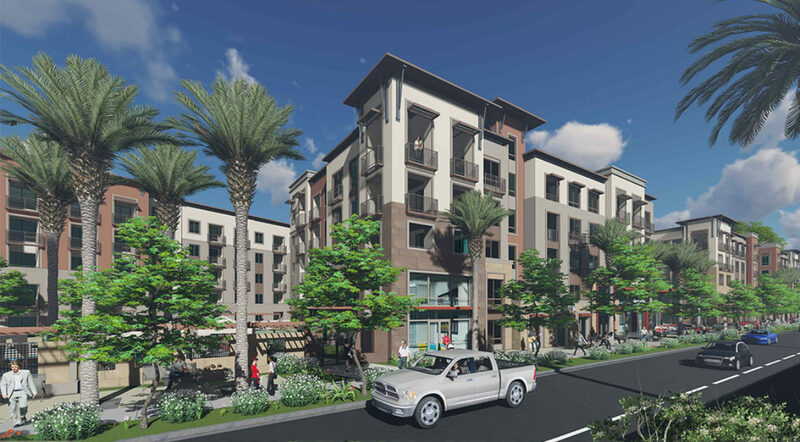 The 4.3-acre complex, designed by Architects Orange, will be served by a six-level parking structure that will include 28 parking spaces for electric vehicle charging stations. Another eco-friendly addition to the project are the trellis solar panels on the roof, which shade the top of the parking garage and offset a portion of common area energy costs, says a release from the developer. Read more at Curbed LA.